Shackle arrived a bit road weary in Sao Paulo. I read Paul Auster’s Winter Journal and Julian Barnes’ The Sense of an Ending on the plane ride from Sydney to Sao Paulo. I highly recommend both books. Our first gig was just a few hours later at the Mobile Radio BSP programme OIDARADIO. It was at the pavillion of the 30th São Paulo biennial. 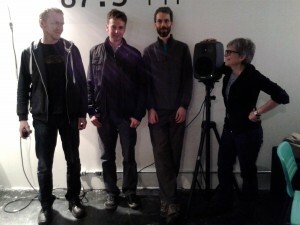 The set we played is at OIDARADIO mixcould website. Thanks to Nick Graham-Smith, Knut Aufermann and Bruno Pallazzo.